There are many good cookie recipes in the world, but finding good care package recipes is more difficult than you might think. Delicious cookies get eaten quickly. It’s a compliment to the baker that there aren’t any cookies left in a day or two. The baker doesn’t know if the cookies would have been good for longer than that (and in most cases, who cares?). Few recipes from web sites or even cook books, tell the reader how long the cookies keep. When storage times are given, they often indicate that the cookies should be eaten in 2-3 days. That doesn’t work for care packages. Packages within the United States generally take 1 to 5 days to arrive. Packages to the Armed Forces stationed overseas take 10 days to 4 weeks. . Mailed baked goods should put a smile on the face of the recipient, not break their teeth. I have discovered a few cookbooks that indicate storage times and include at least a handful or two of recipes for items that stay fresh for 1 week or longer. One of those cookbooks is The Good Cookie by Tish Boyle. It is an easy to read, easy to follow cookbook with some photos. I prefer lots of photos in my cookbooks to know what my finished product is supposed to look like. (That’s probably why I am a Pinterest addict.) 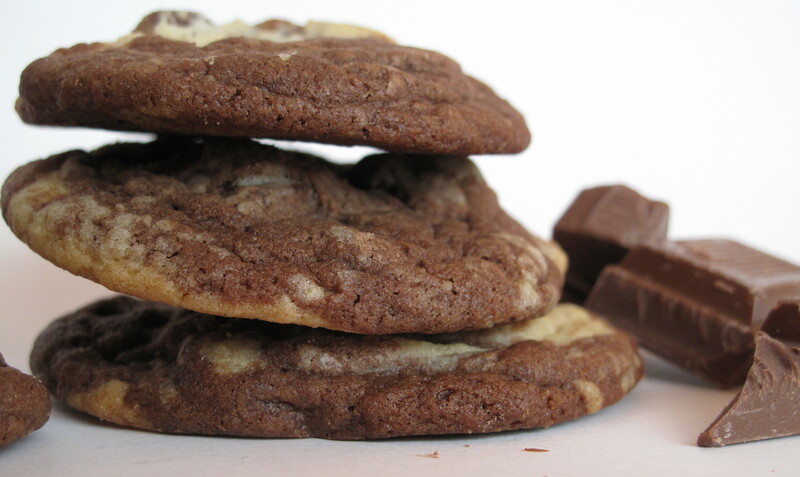 Many of the 250 recipes in the book are for cookies that can be stored for 1 week or longer. Most importantly, I’ve been pleased with the results when trying out the recipes. These Marbled Chocolate Chunk Cookies are a fun twist on standard chocolate chip cookies with only a minimum of extra effort. I did make one big change to the process of making these cookies. I suggest freezing the dough balls before baking. The original recipe baked unchilled dough and produced flat cookies. I freeze the dough in order to end up with a slightly thicker cookie with less spread. I like the chewy texture better and I find that thicker cookies have a longer shelf life, if they don’t get eaten first. Line the bottom of a jelly roll pan or other large baking pan with sides, with wax paper or parchment. In the bowl of an electric mixer, combine butter and sugars for about 2 minutes. Add eggs, one at a time, and vanilla. Beat until light and fluffy, about 3 minutes more. At low speed, gradually add the flour mixture and beat until just combined. Remove 1 ¾ cups of batter into another bowl. Add the cocoa to the remaining batter in the mixer bowl. Mix until blended. Then stir half of the chocolate chunks into the chocolate batter. Stir the rest of the chocolate chunks into the vanilla batter. When ready to bake: Pre-heat oven to 375 degrees F. Line a cookie sheet with parchment paper. Place cookie balls on baking sheet 2” apart. Bake for 10-12 minutes or until the vanilla dough just begins to brown. Remove pan from oven. Cool on baking sheet for 5-10 minutes them move cookies to wire rack to cool completely. Store cookies at room temperature in an air tight container for up to 1 week. 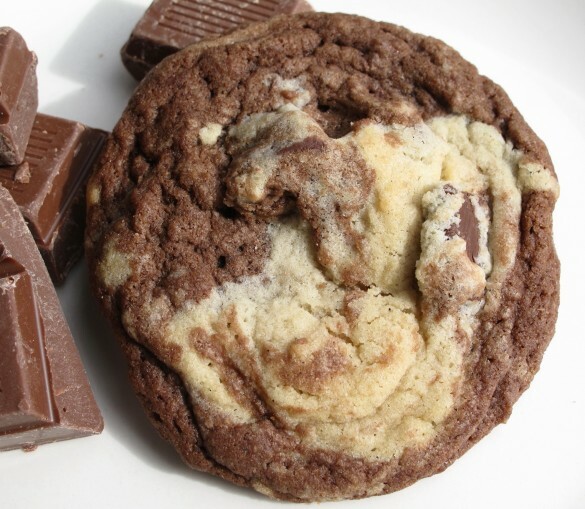 Double wrap pairs of cookies, with bottoms together, in plastic wrap. Place in a column in air tight containers or zip lock bags for mailing. I was saying that : those cookies look terrible and I just want to take my hand into the computer, grab one, and eat one !!! They look incredibly appetizing !! You made a really really good job !! Cookies always make me hysterical haha ! Oh you can send a care package of those over here! Yum-o! These are getting pinned! Thanks. It was super easy to do, Ashley. They do make a good snacking cookie. I had to giggle at the break your teeth comment…lol!!! I am hooked on Pinterest too! Love that place. These cookies look so delicious!!! It’s nice to be back and seeing all my blogging friends. I missed you!! So glad you are back amongst the blogging, Suzie! Computer problems are the pits. Its like a big part of life has to go on hold. I am out of town right now but when I get home I have some deployment care package questions for you, my resident expert. 🙂 I will email. Thanks for being willing to share your knowlege. I would be so freaking happy if I got a box of these cookies in the mail. They look wonderful! I’ve never marbled a cookie before, I can’t wait to try these. And thanks for the freezing tip – I prefer thick and chewy cookies to sad, flat ones (although that wouldn’t stop me from eating them!). Thank you, Audra! 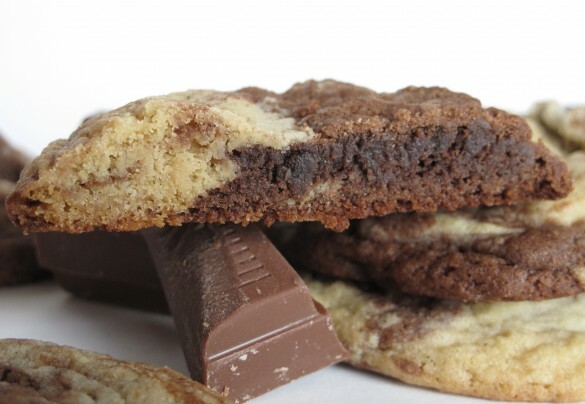 They are a fun twist to the chocolate chip cookie. I’m not sure why, but they did retain their chewiness for a week. What beauties these are! I never saw a marbled cookie before. Love the idea! Very original. marbling cookies makes for such beautiful treats! These look completely amazing and I want to drop everything I’m doing right now to go make them. 🙂 I prefer tons of photos in cookbooks as well – I’m a very visual person! Thanks, Sally! Looking at baking blogs can be dangerous. It makes you want to spend all day making and eating swirled and marbled goodies. 🙂 That’s why I send so many care packages! 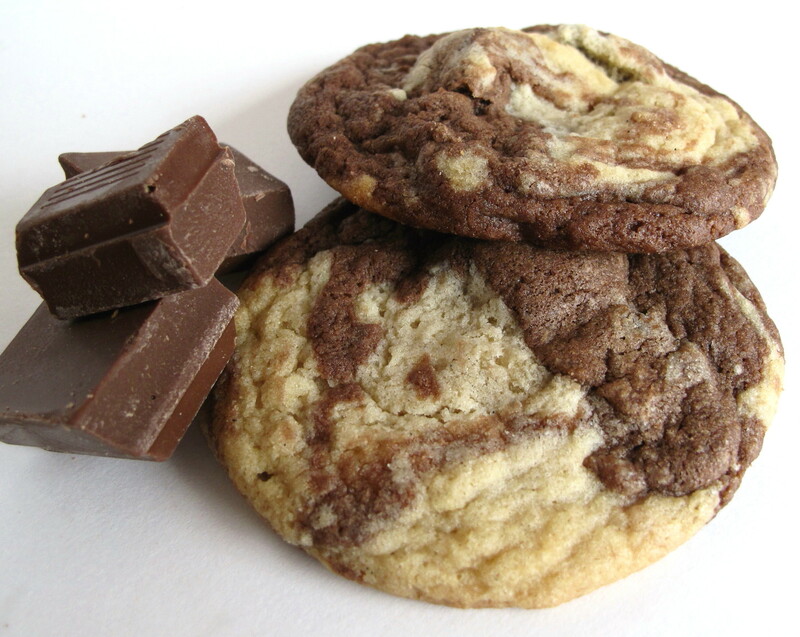 How have I never seen marbled cookies?? That’s so fun! I love marble cakes, too. Yum, yum, these look amazing! Thanks, Chris. 🙂 They are yummy (like your new granddaughter). Thanks, Patty! They are fun goodies for including in a care package. 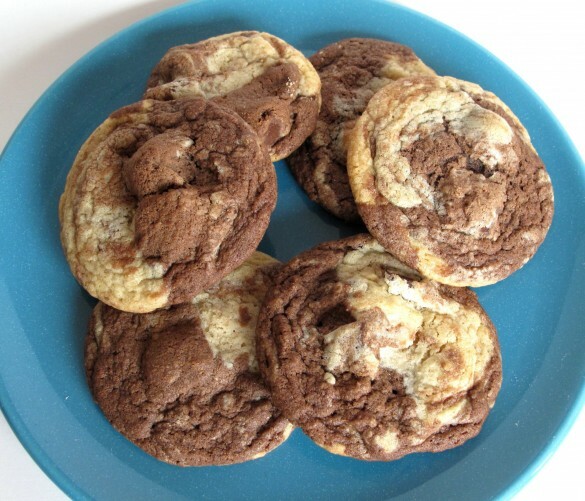 Marbled cookies?! Why have I not done this before! Looks delicious. Aha, this is very true! However, some of the cookies I`ve made, I stored them in an airtight container for over a week and they still taste great! These look wonderful! Hi! First time dropping in and so attracted by your marbled cookies, I love the pretty swirls a lot! 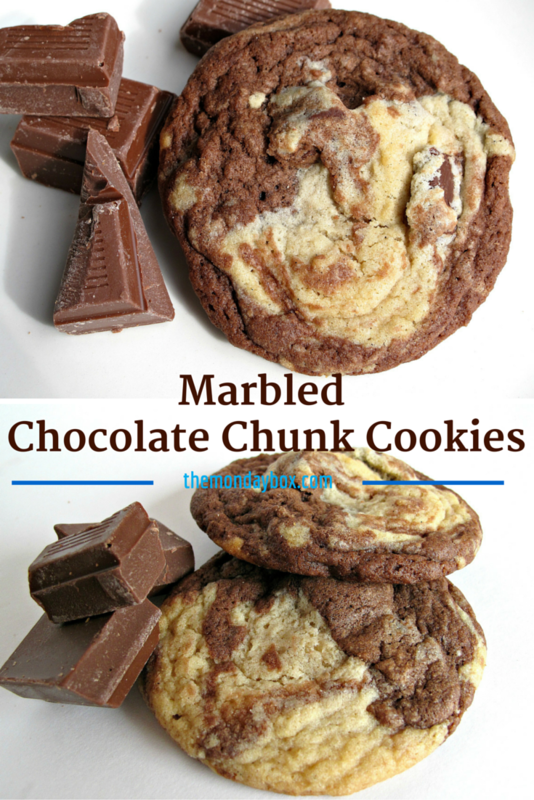 The marbled cookies are so easy to make, delicious to eat, and fun to look at! Those are too fun! 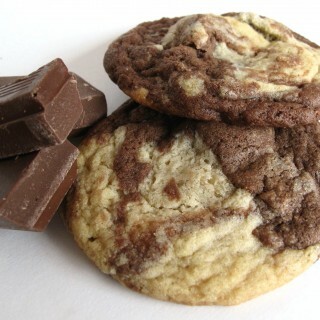 I love a good marble cake, so why not cookies!!! Thanks, Jocelyn. 🙂 The perfect cookie when you can’t decide between chocolate and vanilla.